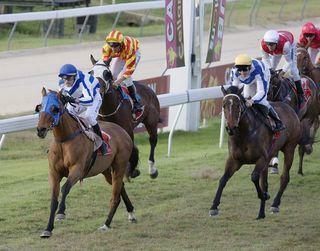 Darryl Hansen :: Stage Shaker wins Cairns Cup. Stage Shaker wins Cairns Cup. TOUGH stayer Stage Shaker held off great rival Sooth Sayer to win yesterday's Cellarbrations Cairns Cup (2100m) after a memorable duel to the winning post.The Mackay gallopers thrilled the Cannon Park faithful as they sprinted down the home straight, where topweight Stage Shaker ($6) edged out Sooth Sayer by a head, with House of Woodwind the same distance back in third. Victorious jockey Robert Thompson, who has ridden more than 3000 winners in his illustrious career, admitted to suffering a few anxious moments in the final stretch of the $40,000 feature race. "In that last 100m, I looked up at the winning post and it seemed to be running away from me and not getting closer," he said. "But he (Stage Shaker) toughed it out. I had a good run in the race. They didn’t go very fast and I was up on the speed so I was happy with that. "After we turned for home, the old guy stuck his neck out and away he sprinted for me." The winning trainer, Mackay’s Darryl Hansen, said he was confident that once the field turned for home, Stage Shaker would prevail. "With the run he had, I knew he would fight to the death," he said. "Since his last run, Shaker has done really well. "He tripped up really well from Townsville this morning and I was rapt for him. "We’ve had a lot of support from a lot of people so it was great to repay them with a win. "Hopefully, he’s got a good few years left in him yet because he is a great old horse."